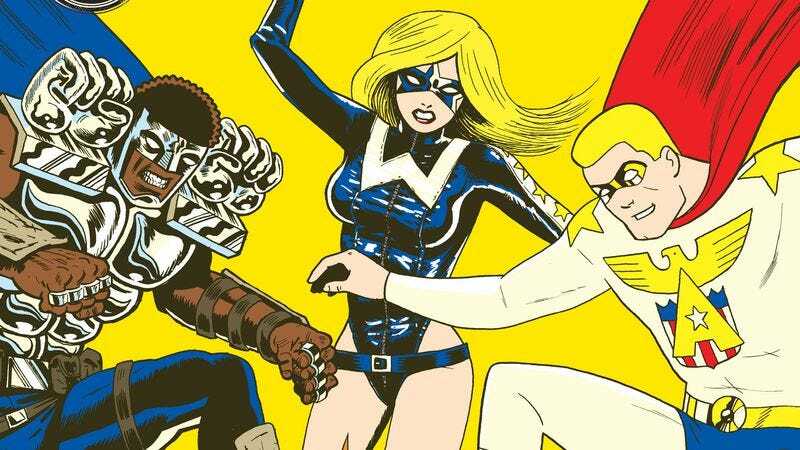 Fantagraphics is one of the premier publishers of independent, alternative comics and graphic novels, so it was a big surprise when they announced last year that they would be launching a shared superhero universe in the new All Time Comics series. The brainchild of brothers Josh and Sam Bayer, All Time Comics bridges generations of comics creators, featuring the work of classic superhero creators like Herb Trimpe (co-creator of Wolverine) and Al Milgrom along with contemporary Fantagraphics talent like Ben Marra and Noah Van Sciver. The series debuts in March 2017 with All Time Comics: Crime Destroyer #1, teaming Josh Bayer with Trimpe and Marra to introduce the colorful superheroes of Optical City, who join forces to stop a group of underground Satanists that want to usher in a new age of American excellence. Crime Destroyer #1 features the last art by Trimpe, who passed away in 2015, and these preview pages showcase the explosive energy that made his art so perfect for superhero stories. Inked by Marra with hyper-saturated retro coloring by Matt Rota, this sewer showdown looks and feels like a blast from superhero comics’ past. Everything is extremely heightened, from the character designs (Crime Destroyer’s clenched fist shoulder pads are ridiculous) to the action staging, coloring, and lettering. It’s a striking departure from the modern style of superhero comics, and it will be exciting to see how All Time Comics continues to twist the genre as increasingly unconventional creators join the fray.